I've recently been introduced to Greek Feta Dressing (Trader Joe's) and have since become completely addicted. Salad had always been the same sort of thing, with homemade ranch or Brianna's Raspberry Vinaigrette—and it was tired, needed a face lift, and my stomach wanted to see other people. When staying with our friends after we just got back to California, Julia made us an delicious/healthy Greek dinner and it was then I met Trader Joe's Greek Feta Dressing. We've been seeing each other ever since (like almost everyday). If you've talked to me at any time since the last week of February I'm sure you've heard an earful already. When I find something I love I gotta tell EVERYBODY! 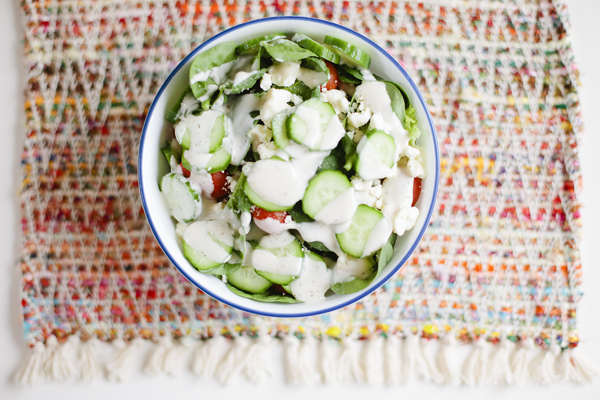 Romain, Spinach, Persion Cucumbers, Grape Tomatoes, Green Bell Pepper, Feta Cheese, Feta Dressing... a la amazing! looks delightful! You've reminded me of my fondness for TJ, which sadly doesn't exist in Canada. I got addicted to the many varieties of hummus while I lived in NY. Have you tried the Cilantro Lime dressing?? Or the Mediterranean Hummus?? Amazeballs. Trader Joe's obsession over here. That looks so delicious! It's making me hungry. I'll have to buy some the next time I'm at a Trader Joe's. If you're in to trying new dressings Mil has an excellent recipe for a cilantro chipotle dressing you might want to try sometime. This picture is making my mouth water. And I'm totes picking up some of that good stuff next time I'm at Trader Joe's. Have you tried Briana's Blush Wine dressing? I've been using that stuff religiously on every kind of salad. It's glorious blended with other dressings, too (like poppyseed and blue cheese). Oh man. I've gotta go make me a salad right now.